Locals say five Yemeni civilians died in a US Navy Seal raid targeting al Qaeda earlier this year, with Washington investigating the claims. The Independent spoke to survivors about the mental and physical suffering they face, and the struggle for justice. Six months after US Navy Seals raided their village in search of al Qaeda jihadis, neither the mental or physical wounds endured by the Adhal family are healing. Twelve-year-old Othman Mohammed Saleh al Adhal spoke quietly, focussing on the middle distance rather than his interviewers, as he recounted what happened in tiny Adhlan in Yemen’s Marib province on 23 May. “I was sleeping outside because it was hot,” he said. Othman gestured to his forearms, both of which bear bullet wound scarring. By the time the gun battle died down an hour later and Othman found his mother, she was weeping over the bodies of his two older brothers. As well as the Adhal siblings, two other young men and one partially-sighted 70-year-old, Nasser Ali Mahdi al Adhal, are said by locals to have been killed in the raid. Human rights group Reprieve, which conducted the initial investigation, alleges that the elderly man was killed after leaving his house to wave to the US special forces, mistaking them for visitors to the village. Reprieve and other organisations, using eyewitness accounts, estimate that between 10 to 15 planes and Apache helicopters descended on Adhlan at around 1am that night. Their target was a house which was sheltering seven men suspected of being members of al Qaeda, a statement from US Central Command said at the time, as well as gathering equipment such as phones and laptops in order to gain “insight into AQAP’s [al Qaeda in the Arabian Peninsula] disposition, capabilities and intentions”. In the daylight the morning after the raid, however, US-made bullet casings and discarded water bottles with English text on them were the only insight the villagers had into what had happened. None of the survivors The Independent spoke to said they were aware of any militants in the village at the time, and that the seven men unknown to them who were also killed in the raid must have arrived during the night. Central Command (Centcom), which coordinates US military operations across the Middle East, and the US Department of Defence, launched an investigation into the events of 23 May in Adhlan after petitions from activists. In a previous statement on the raid, a Centcom spokesperson said: “Centcom takes all allegations of civilian casualties seriously. We work diligently and deliberately to be precise in our air strikes. We comply with the law of armed conflict and take all reasonable precautions during the planning and execution of air strikes to reduce the risk of harm to civilians”. Before the attack the US had been regarded with some respect in the village – aid went towards several school programmes in the area – but now, for many residents, the name conjures fear and pain. Many in the village have trouble sleeping at night. Loud noises bring on post-traumatic stress and anxiety attacks – and the lives of those injured have changed forever. Washington has increasingly relied on drone strikes as well as ground raids in the war on terrorism since Barack Obama entered office in 2009. Among the military and tribal leaders of Marib, the province the Adhal family is from, opinion is split on how best to deal with terrorists, and how much to rely on the US and Arab coalition’s help in combating the extremism that has flourished in Yemen’s almost three-year-old civil war. Almost every single source The Independent met in Yemen – political, military, civilian – said improved access to education and economic opportunities in impoverished communities was a better way of implementing real, lasting change. While he understood the US need to combat al Qaeda, co-ordination could be improved, said powerful local sheik Ali Abdurabbu al Qadhi. “We could be entrusted to handle it ourselves more,” he said. Yemen’s war encompasses many overlapping issues and competing interests. The Saudi-led Arab coalition propping up Yemen’s exiled government and bombing Houthi rebels has been accused of being responsible for thousands of deaths – not to mention blockades against the Houthi contributing to a famine affecting 7.3 million people and the worst cholera outbreak in history. Riyadh maintains that it abides to international law and humanitarian norms in its role in the conflict. It can be hard to criticise the coalition or US’ methods, Marib-based activist Amatela al Hammadi said. “It is difficult to get the local authorities here to investigate drone strikes or raids or escalate these grievances to Riyadh or Washington. They don’t want to speak badly of the people who provide the funding and planes,” she said. The survivors of the Adhlan raid said that no one from the US has contacted them or sent representatives to the village in the last six months, despite Central Command’s official investigation. The perceived lack of care or justice for those caught up in friendly fire is fuelling ill-feeling and having long-term effects on those affected, Ms Knuckey warned. “The suffering families experience after losing a loved one in a sudden attack is made even worse as the US so rarely acknowledges the harm, and there are few prospects for justice,” she said. 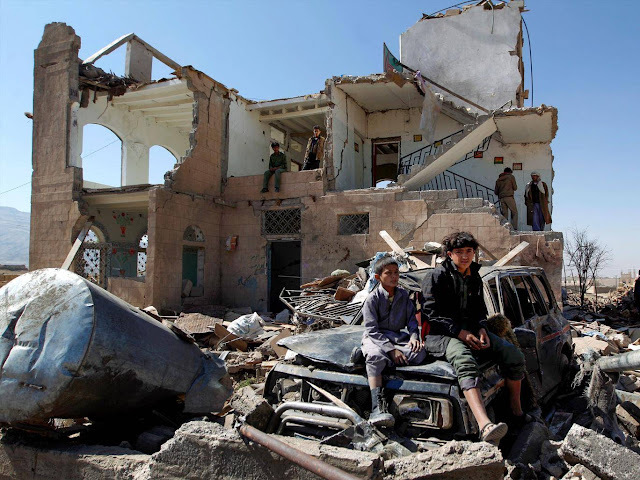 “Where and how should Yemeni families make a complaint about harm caused to them? There’s no clear system in place. The message the US sends when it doesn’t acknowledge or seek to remedy the harms is that impunity reigns and these families aren’t worthy of recognition. “Their allegations need to be seriously investigated by the United States. The families are ready and willing to meet with US officials. “We just want people to hear our story, and hear the truth,” said Abdulrahman Saeed al Adhal, an older family member who acts an advocate for his young relatives. 0 Response to "Amid the carnage in Yemen, civilians also face consequences of the US war on terror"